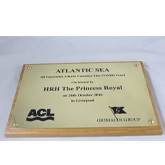 Nameplates and signs can be customised to any size and are available in a full range of colours. We offer a variety of fonts or can work to any artwork provided. Shapes and logos can be incorporated into the design if desired.